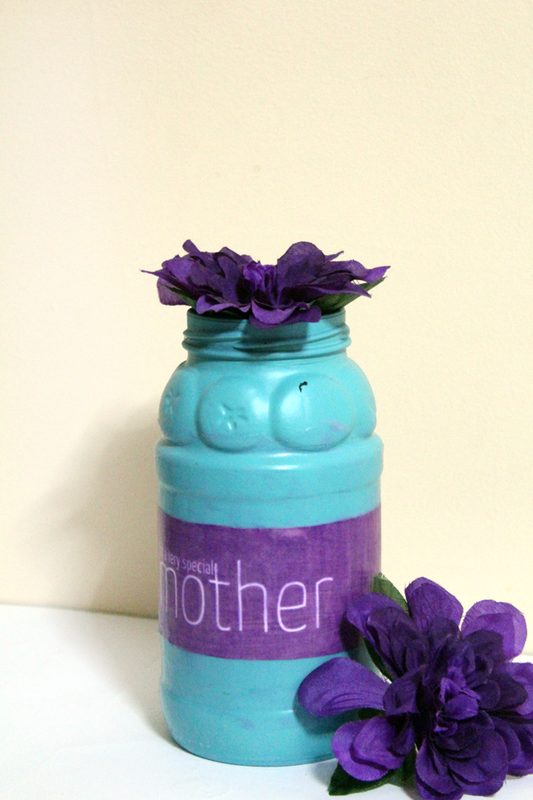 Once you make this Mother’s Day vase craft, what you do with it is your choice. It can either be the subject of your gift. You can turn it into a silk flower display like I did. Or you can use it to contain some chocolates or some fresh flowers. Either way, the personal touch is so meaningful! You can even adapt it into a kids craft quite easily (I had this in mind when creating it.) 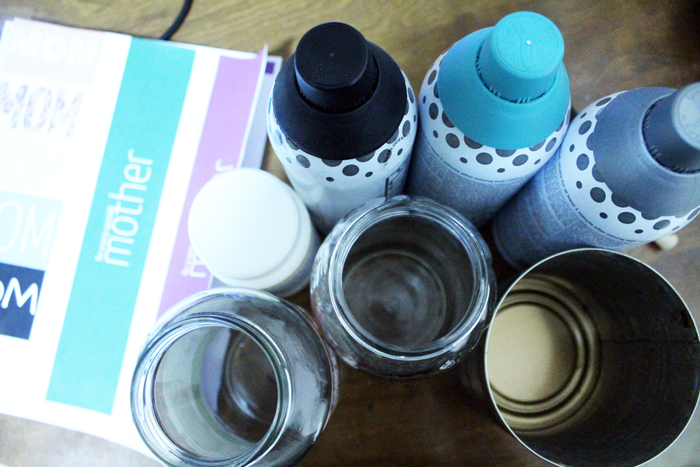 Simply use craft paint instead of spray paint when painting. 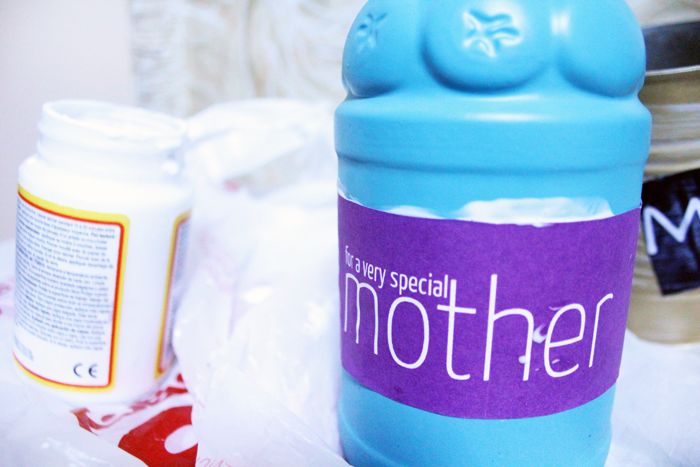 Use the simpler shapes instead of cutting out letters as they are easier to decoupage. Mom will be so pleased with the professional results, and once the decoupage is applied, virtually any kind of paint will stick! 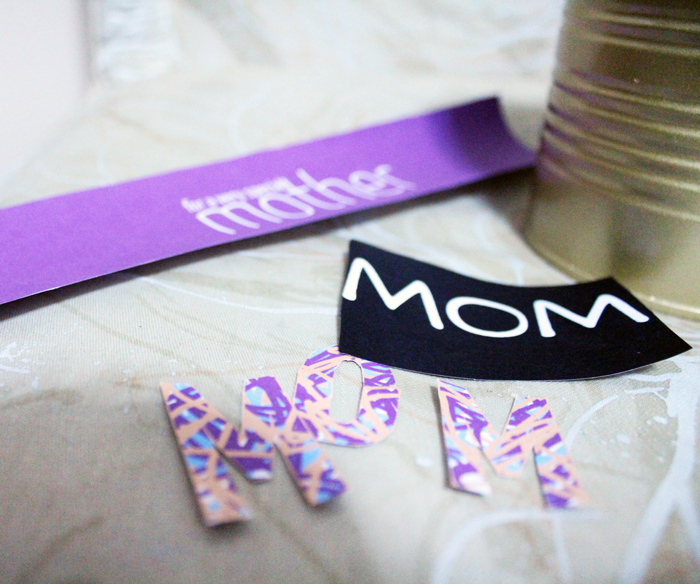 The “mom” printouts – get them here. Or, make your own using scrapbook paper, sharpies, etc. 1. 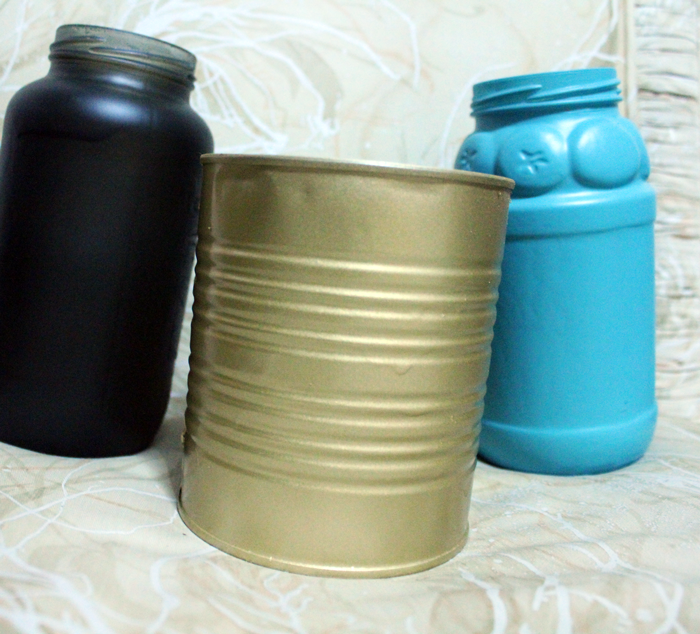 Spray paint your cans and jars. I love how the tin can looks in gold as it preserves the metallic feel while giving it a new look. Tips: Spray a few thin layers, allowing it to dry in between (Plutonium paint dries in minutes) so you don’t have drips. If the weather isn’t nice, I do it indoors. I open a window, find a huge cardboard box, and spray my items inside the box. 2. 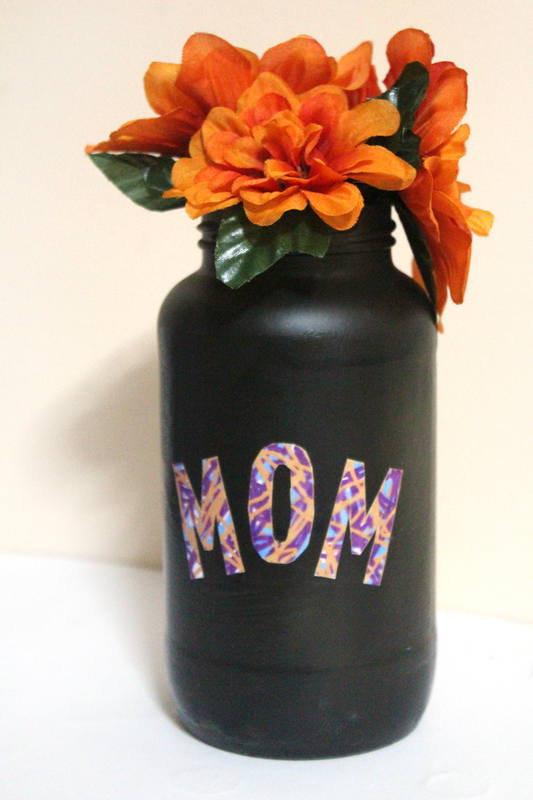 Cut out the “mom” patterns you want to use. You can make your own too using a simple program (think Paint), or just hand write your message on scrapbook paper. Thin paper works best for this (not card stock). 4. Seal it in. 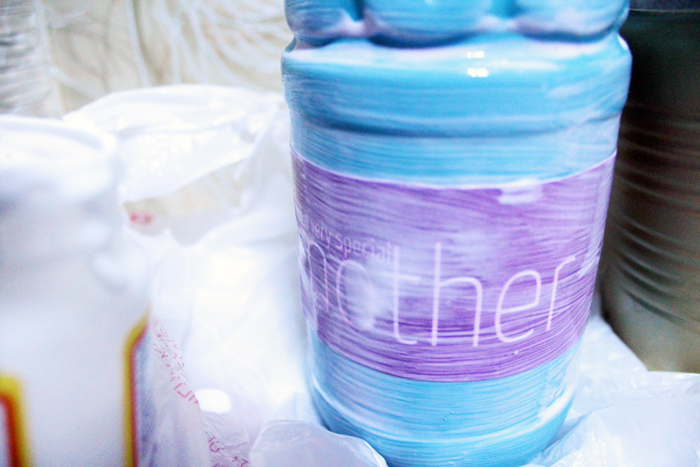 Paint a generous, but even layer of mod podge over the jar, especially in the paper area. Make sure to smooth any creases in the paper. Allow to dry overnight. Tip: don’t go too many times over the paper as the ink can smudge. Make one, or group a few together. It’s your choice. This is such a fun and versatile project that is easy to adapt… so have fun and be creative! Crafts for Teens, Free Printables, Holiday and Seasonal crafts, More printables, Quick and easy crafts, Recycled crafts. Bookmark. Very creative! I love upcyled crafts! These are so cute. And it wouldn’t cost that much to make. Thank you. I’m always looking for easy toddler crafts and this will be perfect for “the grandmas” on Mother’s Day. 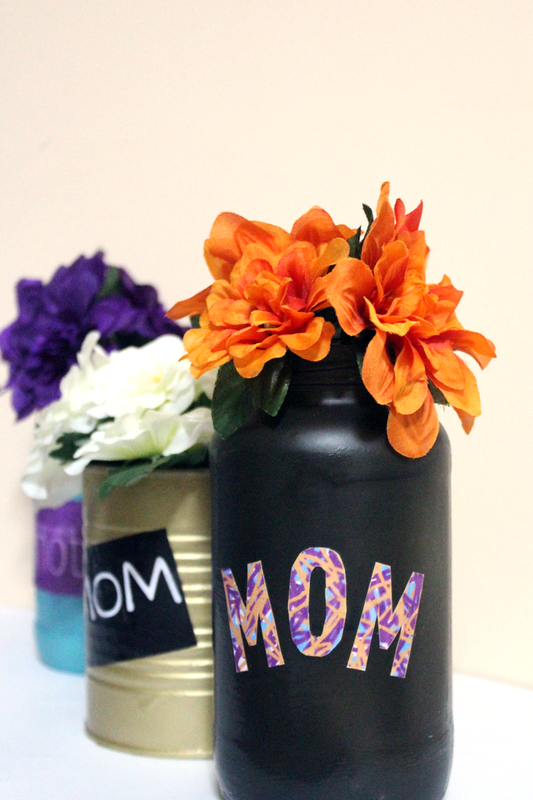 What a sweet Mother’s Day Craft! I would love to receive one of these for Mother’s Day! These are so cute! I wonder if I can talk my hubby into helping my kids make me some for Mother’s Day? Great idea, I love to recycle and I will try this. These are so cute! I’m going to make some for my mom’s desk at work. Thanks! I found your post at Inspire Me Mondays!